Everyone's favourite pushy estate agent is handing shareholders a special dividend. London’s housing market was a mixed picture last year. Although official sale prices continued to soar (obviously) that growth was lower than the insane heights recorded in the previous year and the total number of homes sold dropped by 11% in the 10 months to October, and by 18% in the capital’s exorbitant centre. It seems there is still plenty of cash to be made though. Foxtons, the London-focused estate agent that everybody loves to hate, has just told investors that its sales were up 4% last year to £150m. Its sales volumes were up by the same proportion thanks to ‘market share gains, excellent performance within our New Homes business,’ and the continued roll out of more of its shiny protestor-baiting stores. Revenue within its mortgage broker, Alexander Hall, was up by a third and its lettings business notched up 20,000 transactions in the year. It’s probably not the news that London’s anti-gentrification activists wanted to hear, but their despair is not shared by the company’s investors. 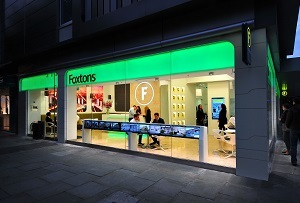 Foxtons shares were up by as much as 3.9% this morning – presumably on the back of news it would be paying them a special dividend of 6.23p per share, and therefore handing over a total of £30m worth of dividends for the year. The bigwigs at Foxtons might be feeling pretty happy today, but its share price is nonetheless well down on where it was two years ago. If the housing market hits a correction any time soon then things could end up looking even more bleak.